Disney's film Frozen is a hit all over the world. Internationally, it has taken in over $750 million at the box office so far. Audiences love the story, the characters, and the music, but the film is a little different for each market—they get to experience these things in their own language. 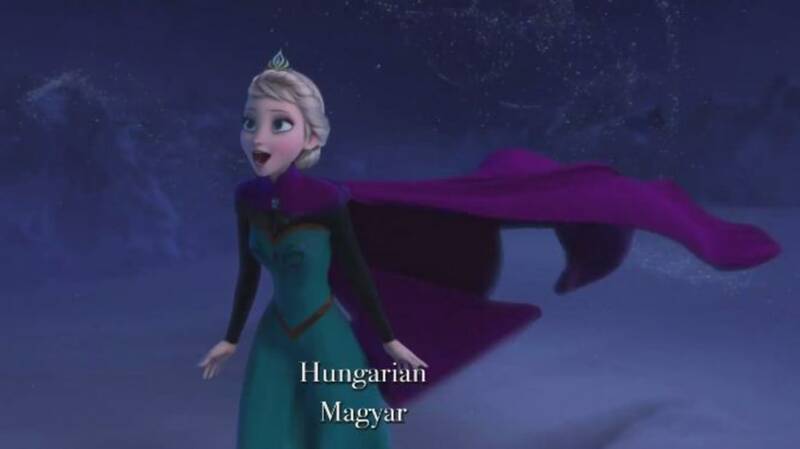 Disney recently released this compilation video of the song "Let It Go" as sung in 25 different language versions. In less than four minutes, it gives you a sense of the impressive scope of Disney's global reach as well as their amazing control of consistency in production. The vocal tone of the different versions is so well matched, they blend together seamlessly. Enjoy "Let It Go" – AKA "Libre Soy" (Spanish) or "La den Gå (Norwegian) – in English, French, German, Dutch, Mandarin, Swedish, Japanese, Latin American Spanish, Polish, Hungarian, Castillian Spanish, Catalan, Italian, Korean, Serbian, Cantonese, Portuguese, Bahasa Malaysia, Russian, Danish, Bulgarian, Norwegian, Thai, Canadian French, and Flemish. Find out what the alternate song titles are, and who these wonderful singers are, at the "Let It Go" Wikipedia page under "Other Versions."